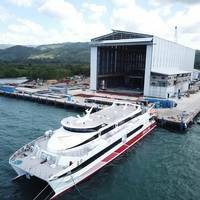 Australian-based global ship building company Austal Limited has commenced construction of the second of two 118 metre high-speed passenger trimaran ferries for Fred. 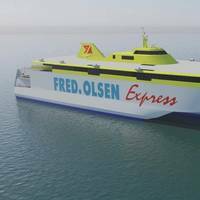 Olsen Express in the Company’s Philippines shipyard.The vessel is due to be delivered by the end of 2020 as part of an A$190 million contract with Fred. 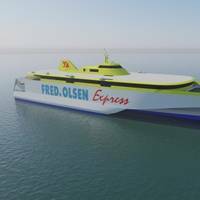 Olsen Express for two 118 metre trimarans, which was awarded to Austal in October 2017.A metal cutting ceremony for the future “Bañaderos Express” was held in the Philippines shipyard, where the official names for the new vessels were officially announced by Fred. Shipbuilder Austal has delivered its eighth Independence-variant littoral combat ship (LCS) to the U.S. Navy.The future USS Tulsa (LCS 16) is the second Austal designed and built LCS delivered to the Navy this year and will be the 13th LCS to enter the fleet.Tulsa’s delivery precedes the future USS Manchester (LCS 14) commissioning, which will take place in New Hampshire at the end of May.Five LCS remain under construction at Austal’s Alabama shipyard. Charleston (LCS 18) is preparing for sea trials. Austal announced the United States Department of Defense has awarded Austal USA US$10,252,142 for a cost-plus-award fee against a previously awarded Basic Ordering Agreement. 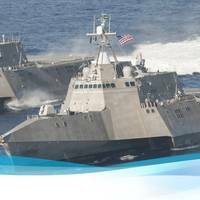 The order provides engineering and management services for advanced planning and design in support of the post shakedown availability for Littoral Combat Ship, USS Manchester (LCS14). Austal will provide program management, advanced planning, engineering, design, material kitting and subcontract management. The work will be conducted by Austal USA across the Mobile, Alabama and San Diego, California facilities. Following the Memorandum of Understanding of 8 December 2017, Austal has announced the award of a A$68 million contract to design and build an 83 metre trimaran ferry for JR Kyushu Jet Ferry of Japan. Australia’s Ambassador to Japan, The Hon Richard Court AC and Japan’s Consul-General in Perth, Western Australia, Mr Tatsuo Hirayama joined Austal’s Chairman Mr John Rothwell AO and Chief Executive Officer Mr David Singleton for a signing ceremony at the Australian shipyard with JR Kyushu Jet Ferry’s President, Mr Masayuki Mizuno and General Manager, Planning, Mr Hitoshi Ogawa. Aulong Shipbuilding, a joint venture company between Australian shipbuilder Austal and Guandong Jianglong Shipbuilding of China, has secured contracts for four new high speed ferries. 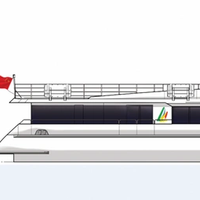 Under the recently awarded A$20 million (US$15.6 million) contracts, Aulong will design and build four 42-meter high speed catamarans for Xidao Dazhou Tourism Co Ltd. Construction will commence from Aulong’s Zhongshan shipyard in Guandong Province in March 2018, with delivery scheduled for early 2019. Australian Prime Minister, Malcolm Turnbull, and Timor-Leste Prime Minister, Mari Alkatiri, announced that Timor Leste would take two of Austal’s Guardian Class Pacific Patrol Boats (PPBs). When contracted this will increase the total production quantity to 21 from the 19 already committed. Following on from a visit to Austal’s dedicated patrol boat facility earlier that day, Prime Minister Alkatiri joined Prime Minister Turnbull to make the announcement, heralding a step forward in regional cooperation. 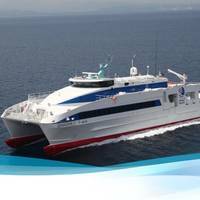 Austal has announced a milestone contract, valued at €126 million (A$190 million), to design and build two 117 metre high-speed vehicle passenger trimaran ferries for long term customer Fred Olsen S.A. of the Canary Islands, Spain. 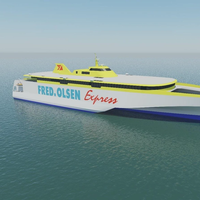 The aluminium trimarans, designed by Austal Australia, will be the second and third trimarans to be delivered to Fred Olsen S.A. who already operate the world’s first and largest trimaran vehicle passenger ferry, the Benchijigua Express – designed and built by Austal in 2005. 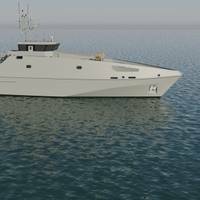 Austal Australia has opened its Adelaide office, which will support the design and production for the $3 billion Offshore Patrol Vessel (OPV) program. 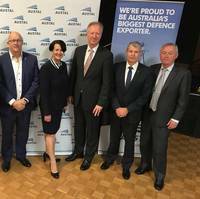 Officially welcoming Austal’s expansion into Adelaide were Martin Hamilton-Smith, Minister for Defense Industry (SA), Senator David Fawcett, and several locally based Small to Medium Enterprises (SMEs) that are already a part of Austal’s 1000 plus Australian supply chain. 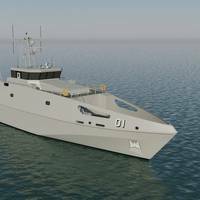 “As Australia’s largest defense exporter, it is only natural for us to have a presence in Australia’s largest naval shipbuilding hub,” said Austal CEO, David Singleton. Austal Limited confirmed a new contract valued at 73 million Euro to design and build a 109 meter high-speed vehicle passenger ferry for Fjord Line of Norway. 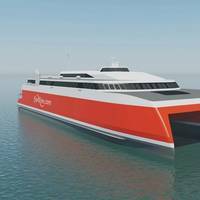 The all-aluminium catamaran, designed by Austal Australia, will be the eighth large high-speed commercial ferry (over 100 meters in length) to be built by the company. “This valuable export contract will create outstanding opportunities for our design, production and project management teams here in Australia,” said Austal Chief Executive Officer, David Singleton. A second high speed passenger ferry contract has been awarded to Aulong Shipbuilding, a joint venture company formed by Austal Limited and Guandong Jianglong Shipbuilding of Zhuhai, China. 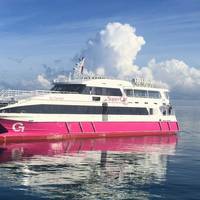 Aulong has been awarded a A$5.6 million (US$4.4 million) contract to design and build a 35-meter high speed catamaran for Chinese mainland ferry operator, Blue Sea Jet. 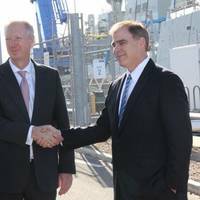 Announcing the contract in Australia, Austal Chief Executive Officer David Singleton said the company’s strong reputation has again secured export business for Austal’s Australian based design team. “Our Aulong joint venture is a great example of how effective technology transfer is developing our export business, with Austal’s extensive commercial portfolio attracting existing and new customers in mainland China,” Singleton said. 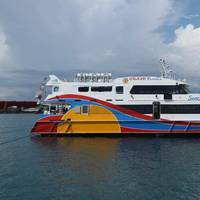 A newly built 50-meter high-speed catamaran passenger ferry for Seaspovill of South Korea, SeaStar 11, has been launched at Austal Limited’s shipyard in the Philippines. 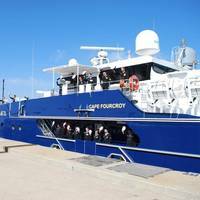 Austal said it was awarded the A$16 million (US$12.1 million) contract to build the Incat Crowther designed catamaran in June 2016, following Seaspovill’s satisfaction with a pre-owned Austal vessel, Seastar 3, constructed in 1998. 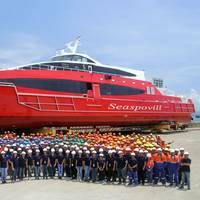 Incat Crowther said it worked with Seaspovill to develop the design of the vessel, offering improvements over an off-the-shelf production design. 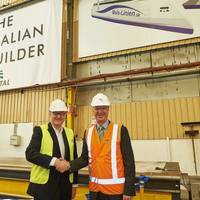 Australian shipbuilders Austal Limited and ASC Shipbuilding have joined forces for the build of the SEA5000 Future Frigates Program. Under this arrangement, the two say they will collaborate in support of the program, pooling complementary strengths, skills and experience. “The Austal/ASC Shipbuilding teaming arrangement offers a compelling, low risk, Australian shipbuilding solution for each of the three shortlisted international designers; BAE, Fincantieri and Navantia,” Austal CEO, David Singleton said. Austal has opened a new Pacific Patrol Boat Replacement (PPB-R) Shipbuilding Facility in Naval Base, Western Australia. 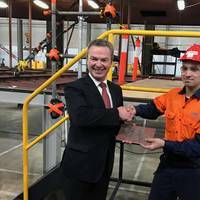 Australian Defense Industry Minister Christopher Pyne cut the red ribbon at the 10,500m² facility in front of defense industry stakeholders, suppliers and partners from across Australia. Austal CEO David Singleton said the PPB-R project is estimated to create up to 207 jobs across production, project management, services and support - from Perth Western Australia to Cairns in Queensland.  Underlying EBIT of $31.2m after excluding arbitration settlement related to 7-year-old claim.  Earnings growth from US shipyard. Lower throughput in Australian shipyard, as anticipated. Austal Limited today reported its results for the six months ended 31 December 2016, with a Net Profit After Tax of $9.3 million. Austal’s financial engine room in the USA, delivered a strong turnaround in earnings, with segment EBIT up 53% on the prior corresponding period (“pcp”) to $41.1 million.